Read SIPRI’s statement, warmly congratulating the International Campaign to Abolish Nuclear Weapons (ICAN) on being awarded the 2017 Nobel Peace Prize. SIPRI interviewed Beatrice Fihn, Executive Director of ICAN as part of the Spotlight film series. Carnegie Corporation of New York has awarded SIPRI researchers one of its eight grants for addressing emerging threats in nuclear security. The SIPRI project will map the impact of machine learning and autonomy on strategic stability and nuclear risk. This innovative and timely research will investigate to what extent these capabilities are elements of the future military modernization plans of the nine nuclear-armed states. SIPRI will be involved in a newly launched online platform, hosted by the World Economic Forum, that brings together top global think tanks to address geostrategic challenges. The aim of the Global Platform for Geostrategic Collaboration is to share expert analysis of global and regional security issues with leaders from the public and private sectors. SIPRI Distinguished Associate Fellow, Dr Lars-Erik Lundin, has been appointed by the Swedish Government to lead an inquiry into the consequences of a possible Swedish accession to the Treaty on the Prohibition of Nuclear Weapons. 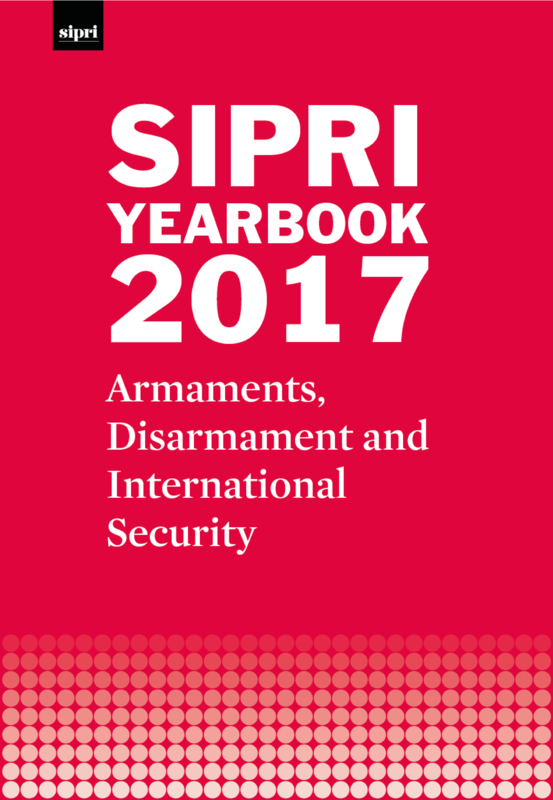 The Russian edition of the SIPRI Yearbook 2016 was launched at the Primakov National Research Institute of World Economy and International Relations (IMEMO) in Moscow this month. Summaries for the SIPRI Yearbook 2017 are also now available in Dutch, Spanish, Catalan, Italian, French, Swedish and English. If a period of fewer arms control agreements and a build-up of armaments is on the horizon, writes Dr Ian Anthony, it is to be hoped that the lessons of cooperative threat reduction will be preserved, ready for a time when they might once again be needed in Europe or in another region of the world. Given the transatlantic disagreement over the JCPOA, European countries might feel increasing pressure to focus on Iran’s ballistic missile activities in order to find common ground with the USA, writes Dr Tytti Erästö. But is the Western perspective on Iran’s missile programme based on an objective threat assessment, and is a punitive approach helpful in addressing it? Dr Tarja Cronberg and Dr Tytti Erästö argue that the European Union must do everything it can to preserve the historic non-proliferation achievement that the Iran deal represents. On 20 October the First Committee of the United Nations General Assembly discussed the annual report by the UN Secretary-General containing military expenditure data submitted by UN member states. Analysis by SIPRI indicates that many states, including countries in sub-Saharan Africa, release much of the relevant data into the public domain. The challenge for the First Committee is to encourage them to submit this data directly to the UN. There appears to be a general consensus among UN agencies that conflict, as a root cause of hunger and malnutrition, needs to be addressed. Evidently, this is easier said than done, writes Dr Florian Krampe. Richard Ghiasy reflects on what is close to 40 years of violent conflict in Afghanistan. The water crisis in the Middle East and North Africa—the most water-scarce region in the world—is rapidly worsening, yet decision makers appear unwilling to acknowledge its severity, and water remains low on the political agenda. SIPRI will host a conversation event with a keynote address from Dr Francesca de Châtel, journalist, editor and author specializing in water issues in the Arab world and Mediterranean region. SIPRI will host the forthcoming 2017 EU Non-Proliferation and Disarmament Conference at Egmont Palace in Brussels on 12–13 December 2017. The conference aims to encourage discussion within civil society—particularly among experts, researchers and academics—about measures to combat the proliferation of weapons of mass destruction and their delivery systems. Social media has become one of the world’s most influential tools for promotion and branding regardless of industry and audience. This event assessed the militarization of social media by focusing discussion on the online mechanisms, strategies and tools employed by the arms and military services and military video games industries. The seminar—co-organized by Global Challenges Foundation and SIPRI—focused on why climate change should be on the agenda of the UN Security Council. Mark Bromley presented SIPRI's online database for Mapping Arms Trade Treaty-relevant Cooperation and Assistance Activities at a side event in New York. The event was co-sponsored by the Permanent Mission of Trinidad and Tobago, Control Arms and SIPRI. ‘Peace now, more than ever’ was the theme of this year’s Alliance for Peacebuilding annual conference where Dr Gary Milante, Director of Studies for Peace and Development at SIPRI, moderated the session on ‘Innovative Financing for Peace’. SIPRI co-hosted the third annual Life in Kyrgyzstan (LiK) conference in Bishkek. During the two days, the conference was attended by more than 110 participants, representing government agencies, academia, civil society, international organizations, independent researchers and the private sector. SIPRI seeks a Senior Researcher and Director of Studies to lead its Conflict and Peace cluster. SIPRI is seeking a Research Assistant for its work in West Africa and the Sahel. SIPRI is seeking a Research Assistant (Administrative and Finance Management), West Africa and the Sahel. SIPRI and the Swedish Ministry for Foreign Affairs hosted the fourth annual Stockholm Forum on Peace and Development in May. This year's Forum focused on 'what works' in preventing conflict and sustaining peace, with participants sharing practices and experiences from different contexts. This report summarizes key takeaways as well as recommendations and next steps prescribed during individual sessions and select participant reflections. Drawing on the presentations made at the 2016 Stockholm Security Conference on the theme ‘Secure Cities’, this SIPRI Insights paper argues that the successful development of a city requires the elaboration of an integrated urban security strategy based on the three pillars of inclusivity, resilience and safety.